Looking like the French National Champ. As well as a worthy GC contender; with his team in the background, and his Directeur Sportif alongside, consulting tactics, is our very own Baroudeur from Down-Under, Craig Shipton. In the summer of 2009, Craig decided to ride from London to Athens, and created 25000spins. He now organises charity rides that take people to some of the most beautiful places on earth. On their latest expedition to the Great Ocean Road, Australia, 100 participants of all levels took to their bicycles. But this is more than just a cycling event; Craig discovered that not only would it take apporoximately 25,000 spins to reach Athens, there are also a numbing 25,000 children under the age of 5 that die each day due to poverty-related causes. This has to stop somehow. 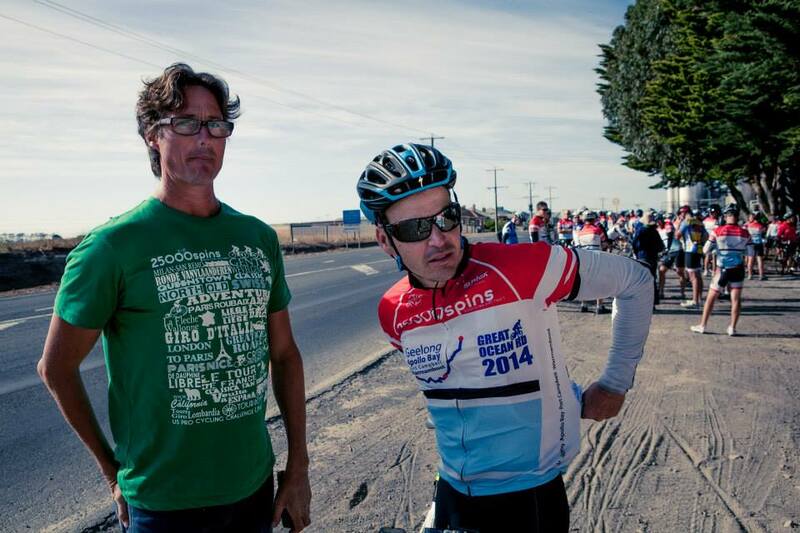 To date, this one event, the Great Ocean Road 2014, has raised a phenomenal $193,000 AUD (£104,154). And, since 2009 people have raised a staggering $762,870 AUD. All in the name for justice, equality and humanity. It’s amazing what you can do on a bike. So proud of you Craig. Keep seizing your mountain!